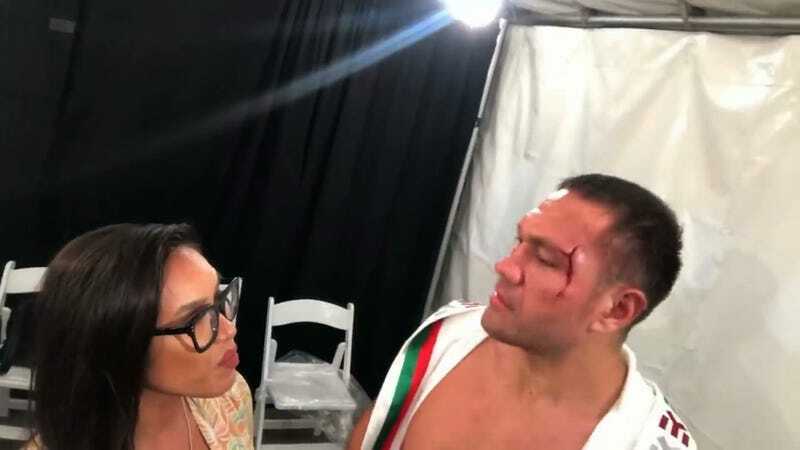 One day after Jennifer Ravalo and Gloria Allred called on the California State Athletic Commission to suspend heavyweight Kubrat Pulev for grabbing Ravalo’s face and kissing her during a post-fight interview last weekend, CSAC confirmed today that they’d do just that. “Before he will be licensed to fight in California again, boxer Kubrat Pulev must appear in front of the commission and demonstrate that he will conform to this principle of respect,” a spokesperson said. That means Pulev is functionally suspended from fighting in California until May 14 at the earliest, though Pulev hasn’t publicly commented on the case since claiming it was all friendly and misunderstood by the public. Ravalo not only disputed Pulev’s non-apology, but also said he groped her and later asked her to delete the video of the kiss. “No woman should be treated this way. He had no right to kiss me,” she said at the presser yesterday.